① put a couple inches of soil in the bottom. ② place about 4 to 6 seed potatoes evenly spaced on top. ③ Cover with more soil, water and observe, as they sprout and the plants emerge, continue to add soil until the plants emerge out the top of the bag. ④ Afterward, it only needs to be watered and irrigated at regular intervals to keep water and nutrients. ⑤ After observing and waiting for the potatoes to mature, you can take out fresh potatoes directly from the bottom of the velcro window. Look forward to your harvest this year and in the future! 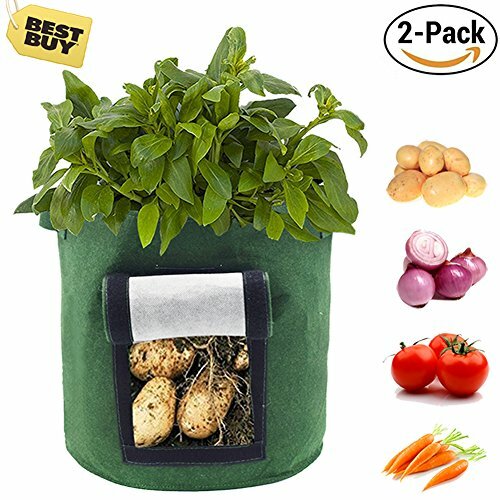 ① Rugged wool felt material.Double fabric design, and a solid handle, easy to move, very suitable for outdoor and indoor, balcony use, you can easily grow your own plants. ② The design of the roller shutter window allows you to observe the growth of the vegetables at any time and extract delicious small potatoes when you want. ③ Can be used repeatedly, if one day you do not want to grow potatoes, you can also use it to grow lettuce or spinach, or even your favorite beautiful flower. ④ Perfect after-sales service: If you are not satisfied with our products, you are very welcome to contact us, we will give you a satisfactory service and solve your problems. EASY OPERATE & USE: Has a firm handle that allows you to move it easily, And does not need to remove plants and soil when harvesting plants. You can do it easily. OBSERVE & HARVEST WINDOW: Great Design! The potato grower plant bag have designed a window that can be opened and closed, through which you not only can check whether your plant is mature and you can easily harvest plants through the window.Makes plant growing, and harvesting vegetables easier! STRONG AND DURABLE:We use canvas and felt materials and have a double-layer design that is not only more environmentally friendly and durable, but also easier to breathe to facilitate plant growth.And can be used repeatedly. HAPPY SHOPPING: Saileve is committed to providing each customer with the highest standard of customer service.If you're not satisfied with the Planter Bag for any reason, please let us know. We will provide you with the best after-sales service! If you have any questions about this product by Saileve, contact us by completing and submitting the form below. If you are looking for a specif part number, please include it with your message. Formline Supply Premium 3 Gallon Grow Bags [Pack of 5]. Fabric Flower Pots are the Smart Way to Garden. Add these Heavy Duty Planters to your Grow Tent Kit or Hydroponic System to Increase Yields.